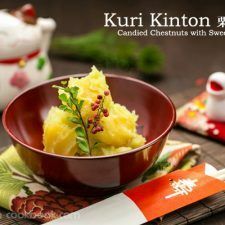 For the final post on the Osechi Ryori (Japanese New Year Meal) series, I am sharing another popuar dish called Kuri Kinton (Candied Chestnuts with Sweet Potatoes). 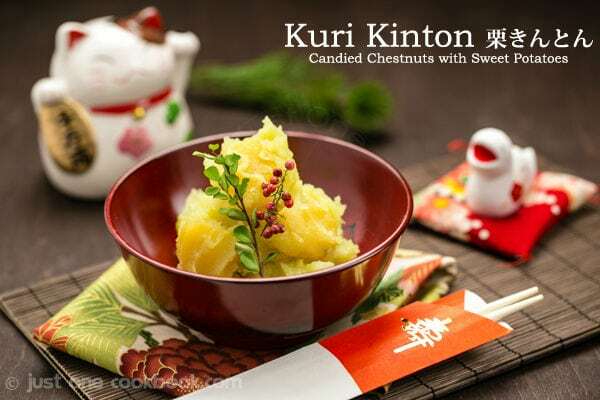 Kurikinton (栗金団) literary means “chestnut gold mash”, which symbolizes economic fortune and wealth and it’s important part of the New Year meal to bring good luck and prosperity for the new year. 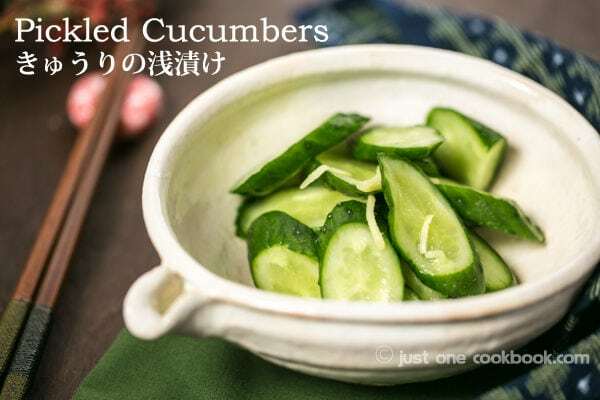 If you make this dish, please use Japanese Sweet Potatoes called Satsumaimo (さつまいも). 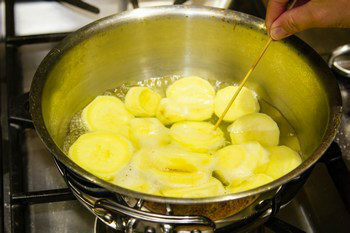 Japanese sweet potatoes have bright yellow color and they are sweeter than regular sweet potatoes. Traditionally we put dried gardenia pods (kuchinashi no mi, くちなしの実) while simmering the sweet potatoes. The gardenia pods give a bright yellow color and they are used to naturally color other food such as “takuan” radish pickles and noodles. Unfortunately I could not find these pods in the US so I couldn’t add them while cooking. The yellow color in the photos is purely from the Japanese sweet potatoes. If you have never had this dish, you might be surprised how sweet it is considering that it is not a dessert dish. You can adjust sweetness to your liking before you add suggested amount. Last but not least, I just want to say a big Thank You for reading my little blog! When the New Year Day comes, Just One Cookbook will turn 2 years old! It’s been such a wonderful journey and without you I definitely won’t be having as much fun blogging. Your kind comments and feedback, and personal letters make my day very meaningful and happy. I am looking forward to sharing more delicious recipes based on your requests (via this post) next year. I’ll be taking a little break from blogging to spend some quality time with my family, but don’t worry, I’ll be back in the second week of January. I wish all of you and your loved ones a happy, healthy and prosperous 2013!! 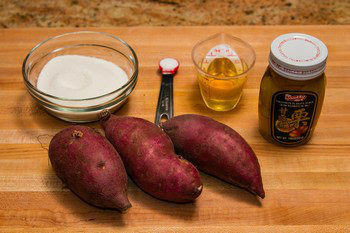 If you are interested in learning about Japanese Sweet Potato, check out Japanese Sweet Potato. 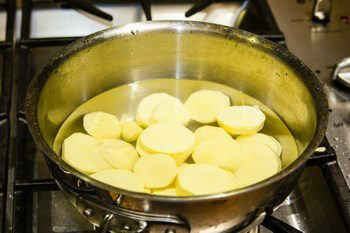 Slice the sweet potatoes into 1/2 inch pieces (so that it will be cooked equally)and soak in water for 1 hour. Put the sweet potatoes in a pot and pour water just enough to cover them. 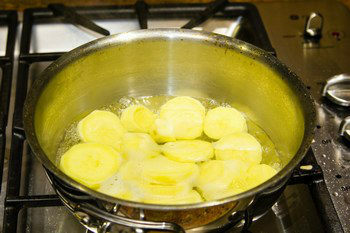 Bring the water to a boil on high heat and once boiling, lower the heat to medium. Cook the sweet potatoes about 15-20 minutes, or until the skewer goes through smoothly. Reserve about 1/2 cup of the water and drain completely. 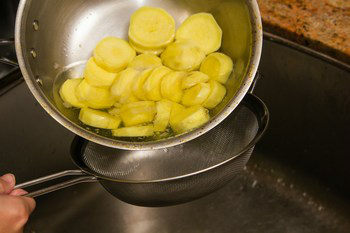 Mash the boiled sweet potatoes through the strainer/sieve with a spatula to remove fiber and lumps. If necessary you can add a little bit of cooking liquid here. Put the mashed sweet potatoes back into the pot. Add sugar, salt, and syrup and mix well. Put the pot back on the stove and cook over low heat, stirring constantly. 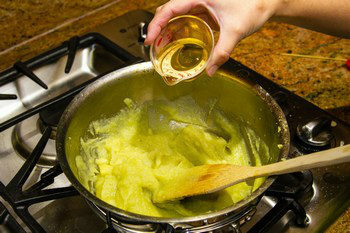 Add the cooking liquid as needed (I didn't need to add but it depends on how much syrup you added in previous step). Add mirin if you want to add more sweetness (I added about 1 Tbsp.). Add the chestnuts and cook for 3-5 minutes or until heated through. 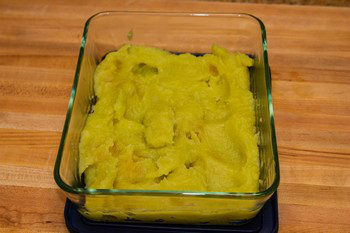 Remove Kuri Kinton into an airtight container and let it cool. Serve at room temperature. Store in the refrigerator and consume in 3-4 days. Kuchinashi no mi (dried gardenia pods): This give a sunshine yellow color when simmering sweet potatoes. 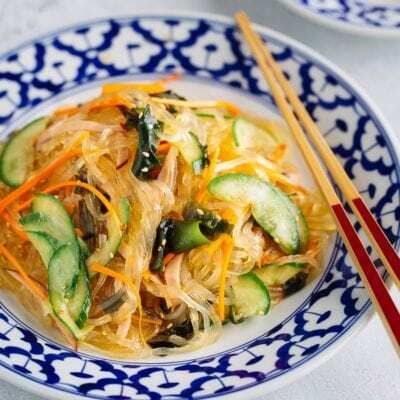 They are used to naturally color “takuan” radish pickles, noodles, and other foods. If you can find them, crack in half and wrap in a cheese cloth to cook with sweet potatoes. Hello! If I’m using marrons glacé in a box, how much should I put? And what can I use instead of the syrup since I’m not using jarred chestnut? Thank you and hope you and your family have a wonderful new year! So Pretty and beautifully made, Nami! I love your pics, really brings the colors together! Gorgeous!!! I learned something new today. I didn’t know gardenia pods can be used for cooking and how they give the natural yellow coloring. This dish looks absolutely divine like the rest of your posts. Thank you for sharing all these delicious Japanese dishes. 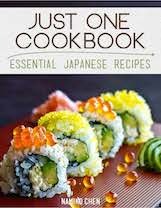 If not for you, I wouldn’t be learning anything about the Japanese cuisine. Happy New Year and Happy 3rd Blog Birthday! May you have all the blessings and happiness in life! I just can’t get over how beautiful every single dish looks here in your blog! I can’t get over how absolutely stunning your photos are. I am inspired! Wishing you and your family a very Happy New Year and congratulations on 2 wonderful years of blogging! Another beautiful New Year’s dish. I finally tasted chestnuts this year and found the flavour very subtly sweet. I wondered whether the chestnuts would be pureed together with the sweet potatoes but I see that they’re included as a sweet textural surprise inside the smooth mixture. Very unique. 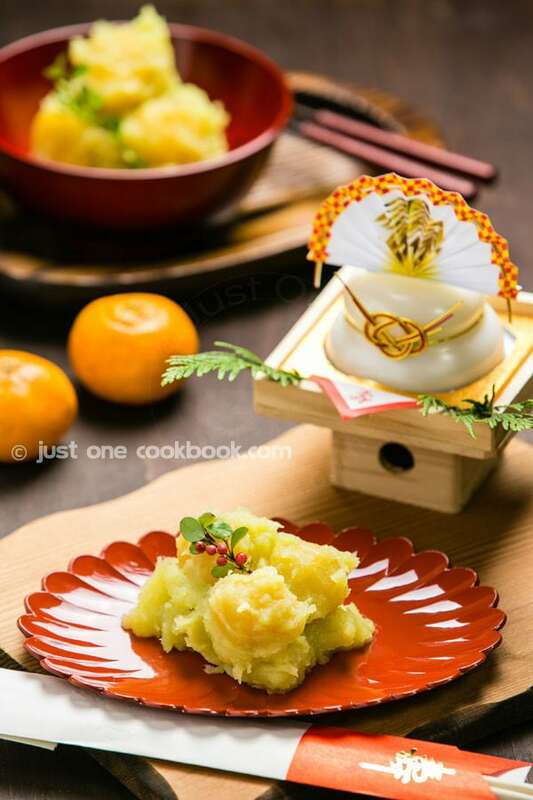 Love how beautifully you have styled the mashed sweet potato, Nami..all your pictures look so vibrant and full of life! Have a very happy New year. Love. Nami, i love this series of photo, look so stunning and beautiful.. This sweet just nice to usher a New Year.. Thanks for sharing all wonderful recipes throught out the year of 2012, we are looking more in 2013. Happy New Year 2013 to you, shall await for your return. Love this! 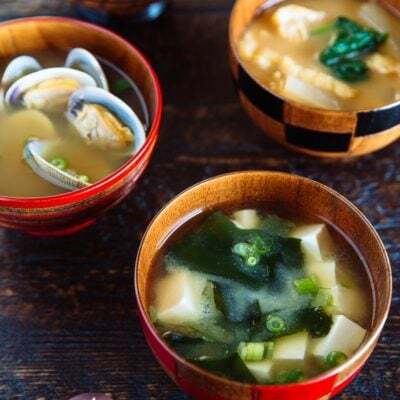 It is so interesting to learn that Japanese food is so diverse. 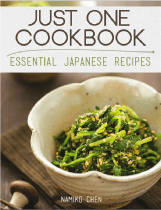 I only knew a handful of Japanese dishes before I started reading Just One Cookbook. Congratulations on your second year. Wishing you and your family all the best for the new year, Nami! I could use luck and prosperity this New Year! This look creamy and delicious. Wishing you and your family a wonderful New Year Nami!! What a beautiful color! Love all these wonderful ways to celebrate the new year! those look like the sweet potatoes we ate in south africa. harder to get here, we get mainly the softer more orange ones. That does look good. I love all the symbolism in your food. Happy New Year to you and your family, Nami! I’m sure it tastes like heaven! Happy Holidays Nami, I’m wishing you all the happiness, may the new year be one of the best of your life. Chestnuts and sweet potatoes? This is amazing! Must do this. My family will enjoy it for sure. Thanks for another easy and delish recipe, Nami. All the best for 2013 ! Sounds very exotic, although chestnuts is quite a known ingredient to me. I never thought of using it together with sweet potatoes. I really wish I could get some Chestnuts! Happy (early) New Year to you and your family!! Arigato Kimmi! Happy New Year to you and your family! Your photos are SO gorgeous!! This looks so comforting and healthy! Nami, your photography is stunning! 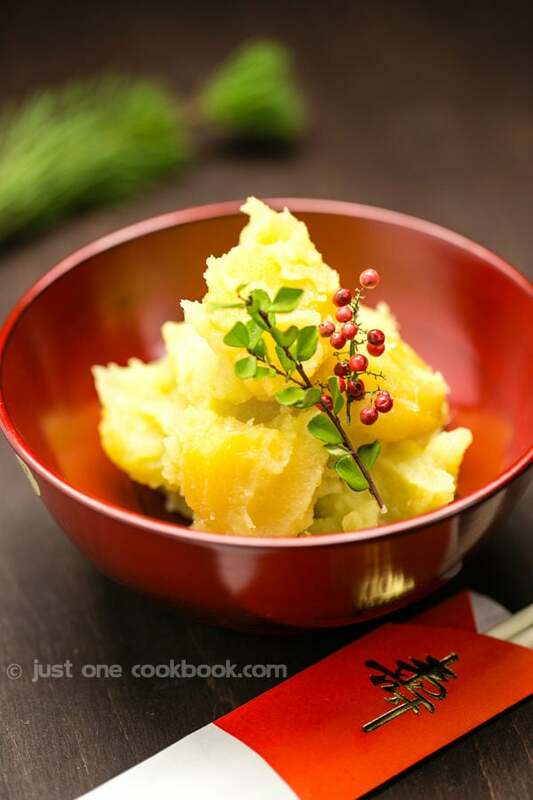 I LOVE japanese sweet potatoes – must make this!!! Wishing you a happy new year, love! Have you tried the okinawan sweet potato which is purple and mealy? I like it and wonder if how different it is from the satsuma potato. Hi Jim! Yes, I love the purple sweet potatoes! I made this pie with the sweet potatoes. How pretty and easy. I love sweet potatoes and eat them all the time but never combined them with chestnuts. Love the color of this dish Nami! Happy New Year to you and your family..hope you are enjoying the holidays! What a beautiful presentation! This sounds so delicious, Nami! Have a wonderful NYE and Happy New Year!! What a beautiful presentation, Nami! Nami, what a beautiful post you have here! I love every detail on your photos. The colors are so happy. This is absolutely amazing dish. I wish I can celebrate New Year with Japanese traditions. I wish many wonderful days to you and your family in new year. As usual, Nami, your presentation looks amazing. 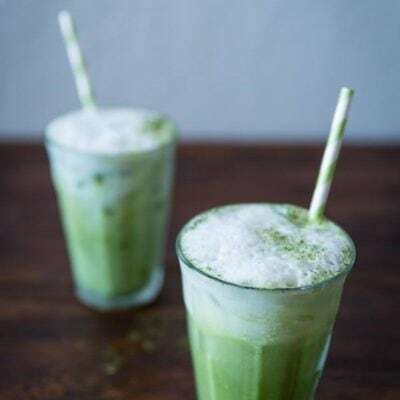 So calm and refreshing – very Japanese and very Zen. I better cook some of these for New Year’s Eve so might have some economic fortune / prosperity for the coming year! LOL! Happy New Year, my friend! Anyways Have a Prosperous New Year to you and your family Nami! Hi Nami, I love sweet potatoes so would enjoy this dish….great cheerful dish to end 2012…Happy New Year ! Happy New Year Nami! And congratulations on two years. It’s been two years for us now too. Isn’t it amazing how much blogging can bring into your life?! I’m very thankful that it brought you and your blog into ours. Our home is more delicious for it and our life is all the richer. Thank you. Here’s to a fantastic 2013 – and with dishes like this one, it’s not doubt it will be. This looks so tasty. I love how colorful and happy it looks too. Cheers Nami! You know Nami, I can spend hours looking at your beautiful pictures! I love your styling and photography, you are truly an artist. I pressed submit too soon! Oh, I’m glad you did this recipe. It sounds so wonderful, I definitely have to try it sometime. I’m pretty sure I can get my hands on Japanese sweet potatoes, but of course I’ll have to check my market. Congrats on two years of blogging! Everything you do is first-class — the recipes, the writing, and the photography. Enjoy your brief time off, and we’ll all be here (and hungry!) awaiting your return. Happy New Year! A wonderful treat! That is such an unusual dessert. Nami, what a fantastic dish – I had never heard of Candied Chsetnuts with Sweet Potatoes before but it looks and sounds delectable – I am sure I would really enjoy to eat this because I really like to eat chestnuts and sweet potatoes! I also wanted to take the opportunity to send you and your family the very best wishes for the New Year! It has been a pleasure discovering your blog and I look forward to each and every blog post of yours and I cannot wait to see/read all about your amazing recipes in the upcoming year! All the very best from all of us here and a really heartfelt “Happy New Year! – Frohes Neues Jahr!”! What a beauty! I love your presentation and the colour is really stunning. 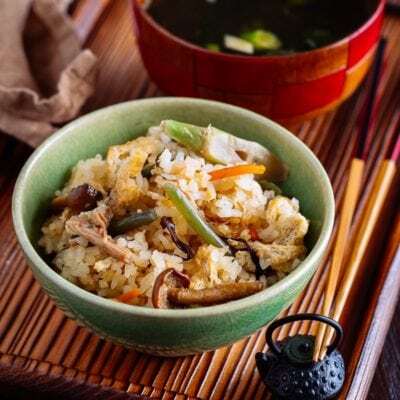 I have never heard about this dish and in general I have an impression that Japanese New Year’s dishes are not known abroad, so I’m very grateful that you share them with us. 2 years is such a short period! I feel as if I had known you for 20! Happy New Year! I’m very impatient to see what surprises you have prepared for us! Happy New Years to you and your family as well! And Congrats, your blog is almost 2 years old!! What a lovely sweet potatoes dish. My mom loves eating sweet potatoes. I love, love chestnuts Nami! They look absolutely perfect! I wish to you and your family a very happy and prosperous New Year full of joy and love! What a wonderful combination of flavors…looks delicious! Wishing you a wondrous and healthy 2013! Oh my gosh, your presentation rocks festivity! I enjoy fresh chestnuts but the last time I roasted them in the oven, they kinda “exploded’ in the oven 🙁 No experience! A totally new dish for me, tho’ I love both sweet potatoes [those I know 🙂 !] and chestnuts . . . Shall take a look in the New Year! Firstly tho’ a huge bouquet to you for taking the blog thru’ two whole years and making it one of the first to which we turn after the computer goes on 🙂 ! Nami’s is a fun place at which we DO learn!! And, naturally tho’ you have to wait for your 2013 for awhile yet, whilst our fireworks are almost upon us: hope 2013 brings you everything you need, want and desire . . .a big hufg across the Pacific!! Thank you for such a sweet comment Eha! Thank you so much for following my blog this year. It’s always wonderful to hear from you. Happy New Year! I love this snack, Nami, as sweet potatoes and chestnuts are 2 of my favourite ingredients. Here is wishing you and your family a very Happy New Year! 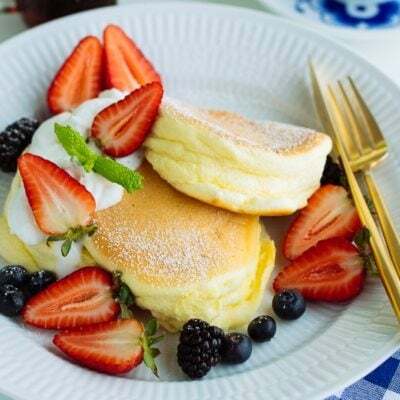 御節料理の中ではこれが一番好きかも。このポストは昨年のものなのね。なみちゃん、あったまいい！先日ＬＡから帰って来て、風邪を引いて寝込んでます。旅の途中で病気にならなかったから、すごくラッキーに思っているんだけど、本人は。2013年も良い年になりますように。コメントいつもありがとう。Have a happy New Year! Sweet Potatoes in Japan you Betcha– A cold night in December walking down a neighborhood street the smell of Baked Sweet potatoes from a push cart vender pip[ing hot in the hand a little soy sauce HEAVEN and the walk continues.. Happy New Year and thank you Namiko and stay out of the kitchen tomorrow! Yaki Imo! Oh yes, those are so delicious and I miss eating it too… Thank you for your well wishes, and Happy New Year to you and your family! Hi Nami, This post is looking great! It was a real delight to see and learn so much from your each and every post. Hope to see more of your creative endeavours in the new year. Wish you and your family a very Happy and Blessed New Year!!! 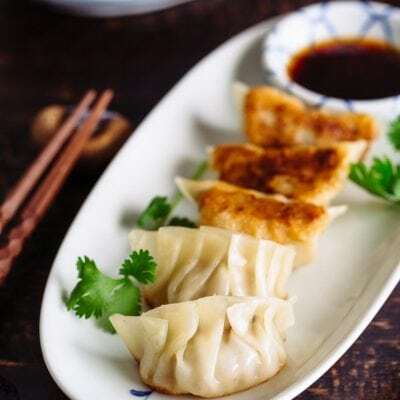 Nami, wishing you and your family a very Happy New Year and continued deliciousness! I don’t think I’ll be able to get the Japanese sweet potatoes but I’m going to give this dish a try with regular sweet potatoes as I’ve lots of chestnuts to use up. Hi Nami, Happy New Year to you and your family. I like Japanese sweet potatoes, although they are much more expensive than local ones but they are a lot sweeter. Thanks for sharing this recipe. Hi Nami and Happy New Year! This is another great treat. Thanks for sharing the celebration series. Best wishes and continued success in 2013! Fantastic color. I’m interested by the mix of candied chestnuts with sweet potatoes. I could see why people make it, I think the sweetness sounds excellent. Hey Nami, I just stumbled upon your blog today and am your newest follower. 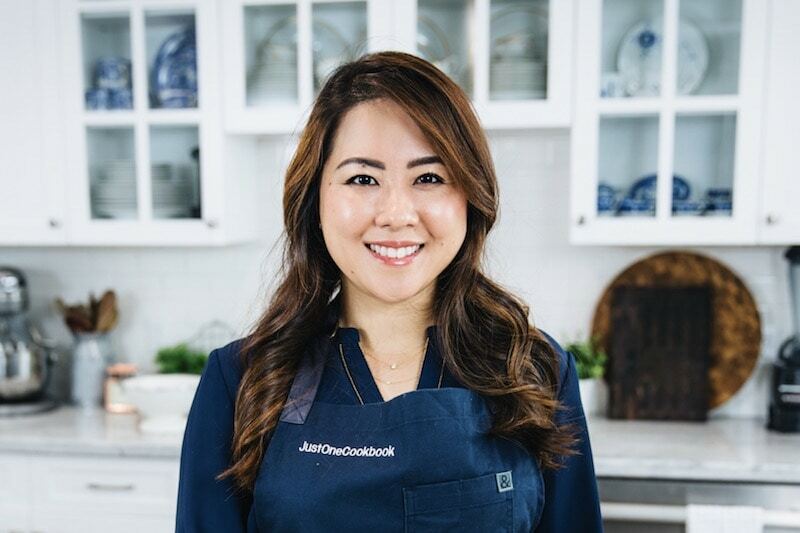 I love your recipes and can’t wait to see what else you have in store! Happy New Years!!! Enjoy some time with the family, you deserve it. 2 years already, time sure does go fast, doesn’t it? Looking forward to seeing all your yummy creations next year. I need this dish for sure, I can use all the prosperity help I can get, lol. What a beautiful recipe! Congrats on 2 years. I love reading your recipes because I learn so much. Gardenia pods? I had no clue these were used for cooking! Wonderful! 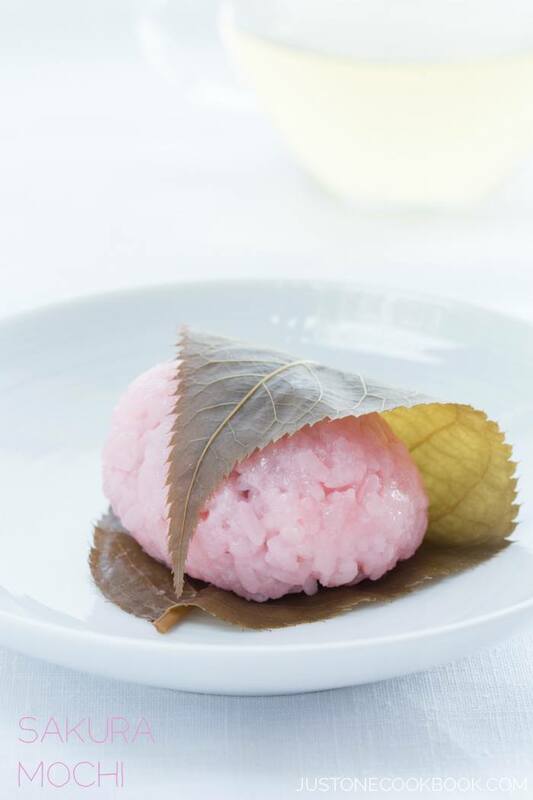 I love Japanese cooking because it doesn’t taste as sweet as most food. Hope you had a wonderful new year! Enjoy your time away, Happy New Year!! This looks delicious! I can’t wait to try this. I have no idea if I can find these sweet potatoes but I’m on a journey and won’t be satisfied until I find them. Happy New Year and I hope 2013 is a fantastic year for all of you. I love this gluten free recipe of yours.It will soon be made in my kitchen. I wish you a wonderful new year with all the good things! 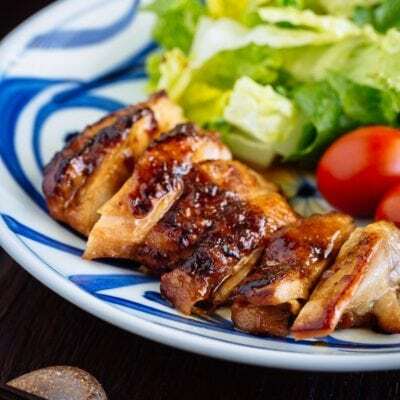 I hope that you will have a great 2013 Nami, and I look forward to more of your wonderful recipes!! Japanese sweet potatoes are indeed sweeter and the colors are very vibrant. Beautiful and stunning photos of the potatoes in the bowl. Have a Happy New Year to you and your family, Nami! Wishing you more success in this year. What an interesting recipe! And I didn’t know gardenia pods for their yellow colour! Beautiful clicks Nami! Will it still tastes the same if I discard Mirin? What an amazing combination of flavors. I love chestnuts,specially in winter. Your presentation is so pretty too! 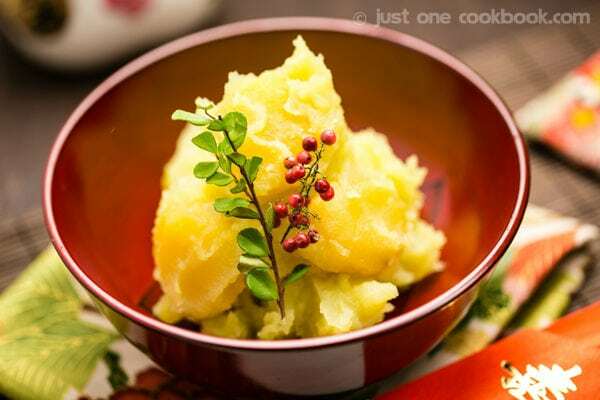 Mash potatoes are always my fav and this sounds quite different but very interesting! Hope you had a happy new year! And happy blogoversary! oh my gosh this looks so good!! I love chestnuts! This dish looks stunning! 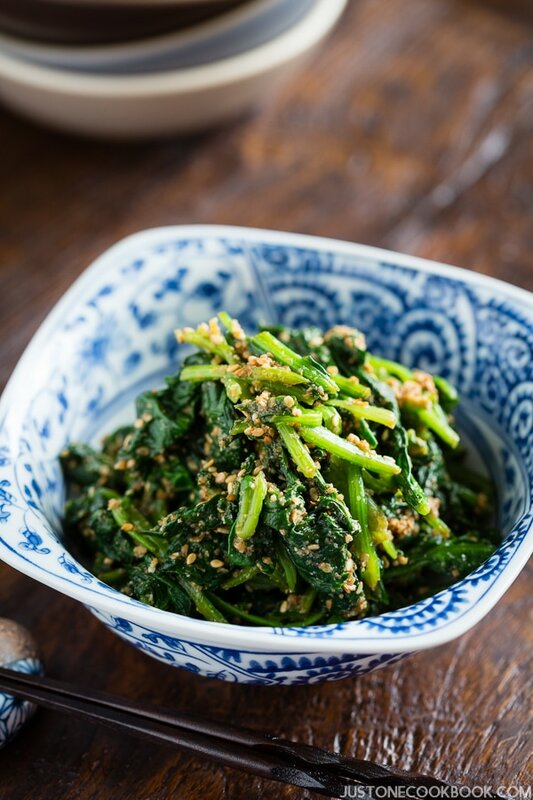 I had a typical southern meal for New Year’s that is supposed to be lucky and the greens to bring prosperity (green for US dollar I guess) 🙂 So I love hearing what others traditions are. We often get Japanese sweet potatoes, I like them better. Plus so easy to get here. Happy new year and blogiversary! Hope you had a wonderful holiday season! Dear Nami, Happy New Year!!!! 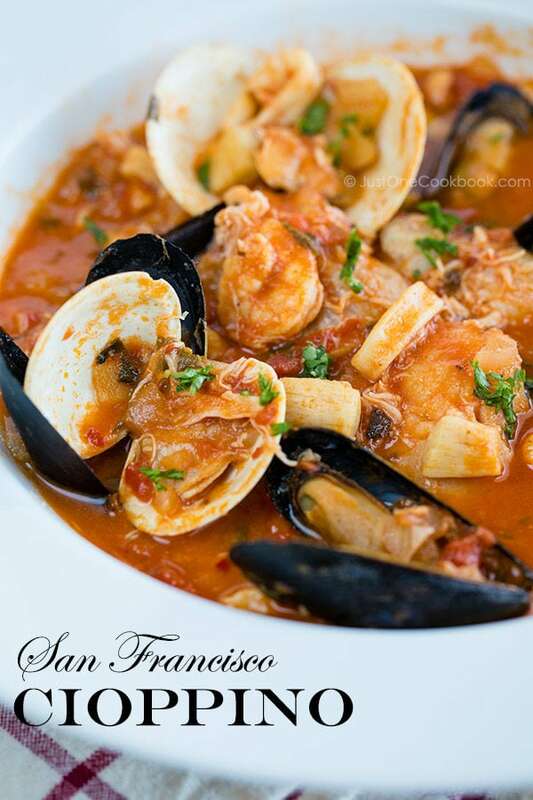 This dish has to be delicious, beautiful picture. Thank you so much for always sharing such an amazing and wonderful food. Happy New Year and 2nd Blog Anniversary! 😀 I love the look of that mash, nice and healthy!! Nami, you are always introducing me to new and interesting combinations – not to mention beautiful! I love how simple and achievable this is as well; that’s my kind of cooking! ;-). What a delightful recipe. Happy New Year Nami! sounds wonderful, i’d love to try this! What a PERFECT way to enjoy chestnuts! How lovely. Japanese sweet potatoes are now on my must-find list. Thank you for sharing…what a nice way to end my weekend (and get ready for dinner!) I hope you have a wonderful week! Your photos are always so gorgeous and I adore seeing the cute little Japanese objects you use. My daughter is back from her study abroad and is still fixated on returning to teach English through the JET program when she graduates. 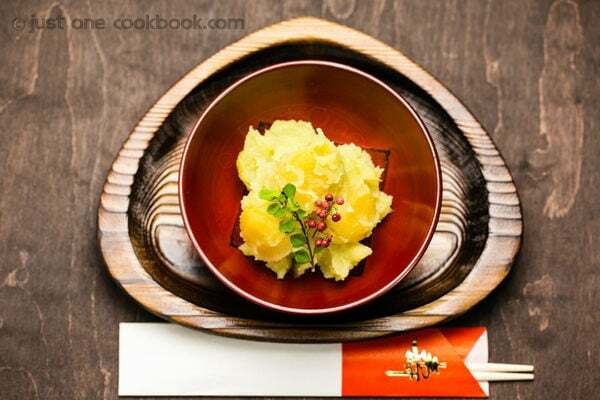 I’m very curious about this dish as I’ve never had Japanese sweet potato or candied chestnuts! Happy New Year and congratulations on your amazing two years, Nami! Nami, First I would like to wish you and your family a Very Happy New Year filled with love, peace and happiness. Now come to your dessert, OH My! So pretty. Happy New Year to YOU, Nami! Sorry to be a bit late but been on a break myself. I love the idea of sweet tatties and chestnuts, even if our French version won’t be at all like this Japanese dish. Tell me, if it’s not a dessert as such, how do you serve this? Is it with savouries or just on its own? It’s fascinating. Congratulations on 2 years of your fabulous blog and sumptuous photos, Nami, and wishing you and your family the most precious times together. Happy New year Nami and to your family. I adore anything chestnut so I am really curious to try this dish. Beautiful presentation. Hi Nancy! Yay! 😀 Thank you so much for your kind feedback. You and your husband made my day. I hope you enjoy other recipes on my site as well. Happy New Year to you and your family! I learned something new today !!! Must try this for sure. Thanks for sharing !!! Your pictures are absolutely fantastic. Hi, I bought some fresh chestnuts. Wondering is they can be used for this recipe. If so, how do I modify the recipe? Is it the same as you recommended to Hfriday? Thanks. Hi Winnie! You have to cook the chestnut till tender (ready to eat). These chestnuts I used are soaked in syrup and very sweet. If you have extra time, I’d soak in syrup (simple syrup) and cook a little bit. It may be a little long process to make this from scratch. I hope this helps. Thanks a lot Nani. Guess I’ll find chestnuts in syrup to make these then. You can find kuchinashi no mi in the United States. Just go to a Chinese herbal shop and ask for zhi zi ren (栀子果), which is the Cape gardenia fruit. I think in traditional medicine it is used to “dispel heat” or reduce fever. I just bring a printout with the Chinese characters and a picture to help. Can you substitute the chestnuts with macadamian nuts? May I ask you where you buy the little red berry with leaves decor? I wonder if a river would work to straighten the potatoes through. Is that too fine? Hi Geri! I’m sorry but I didn’t understand your question. Could you explain a bit more? Darn spellcheck! I meant a “ricer” not a river. I did end up using my ricer instead of pushing the potatoes through the sieve as mentioned in the recipe and it worked great. The texture was smooth and the chestnuts provided a nice contrast. I also rant out of sugar in the middle of preparing New Year’s dinner and substituted honey in this recipe. I really liked the honey paired with the sweet potatoes. Hi Geri! 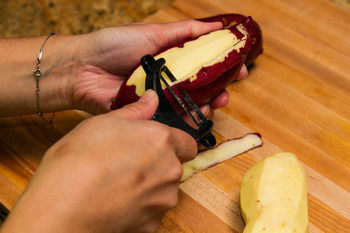 It’s part of my fault for not knowing this kitchen tool “potato ricer”. Even though you mentioned “ricer” I still didn’t know what it is so I had to google! Sorry about that. A ricer is a bit of an obscure kitchen tool for sure! 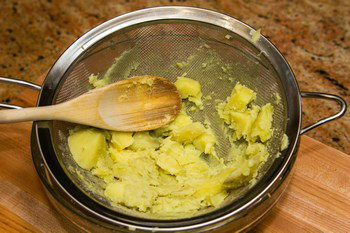 Makes the best mashed potatoes in the world though! My osechi turned out great. Thanks for helping me work in some new recipes this year! 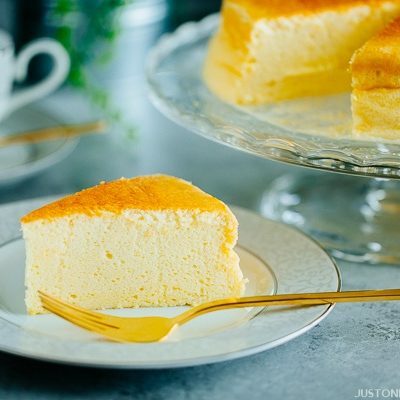 Thank you for sharing many wonderful recipes online. I often reference your recipes before making dishes. 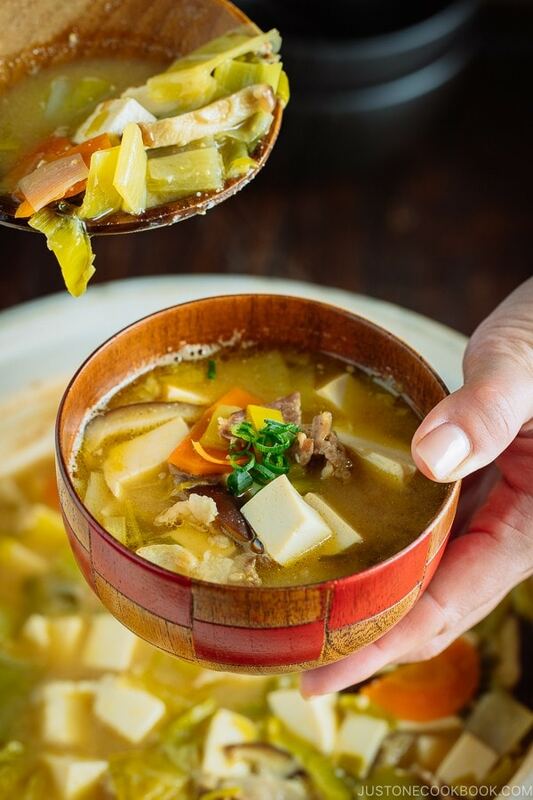 Since I am going to make 栗きんとん this weekend, I naturally use your recipe as a reference and, therefore, learned about your trouble with finding くちなし. While I was looking for くちなし in New York, I happened to learned that both Chinese and Korean also use くちなし but in a different way as Japanese would. 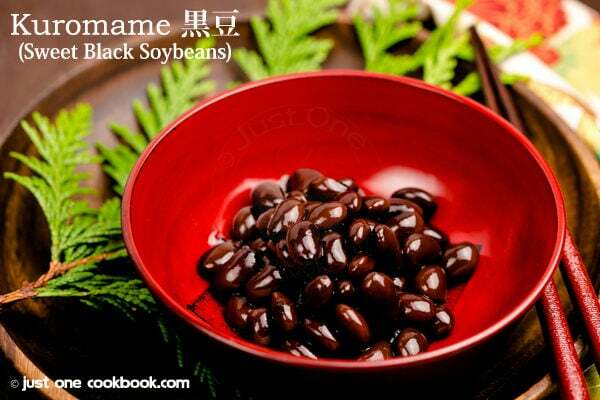 Because くちなし has medicinal properties, it is used as herbal medicine or as tea for Korean and Chinese. You may want to check out Chinese or Korean herbal medicine shops or supermarkets and ask for 黃梔子. Hope you find them the same or similar. Hi E-Wei! I see! Thank you so much for your tip. I’ll remember it when I try it with Kuchinashi. 🙂 I’m glad you enjoyed it. Thank you for writing!